Noemie and I were walking in our neighborhood last night after dinner and picked up one of the many Jewish papers available in our area. This one happened to be called The Jewish Link and is published by an ultra-orthodox segment of the population. We were originally intrigued by the advertisement on the cover for wigs. While reading through it at home, I fell on this advertisement. One might believe that it is an all-women cast and thus, is some kind of feminist statement where the characters are reinterpreted in a hyper-progressive way. It is not such a production, it is performed by an all female cast and only women may attend. The main battle lines between Orthodoxy and the rest of the Jewish movements have been gender segregation. Women cannot be called rabbi, accept an aliyah to the Torah, or in some cases, speak from the dais in the presence of men. Although there are many points of divergence between Orthodoxy and other Jewish Movements, the area that it is most visible is gender politics. Some Modern Orthodox synagogues are now pushing back against this position by allowing women to become sort-of rabbis, ‘rabbah’ or ‘maharat,’ but they can’t use the term rabbi. Regardless of the woman’s qualifications, using the term rabbi to describe a woman in Orthodoxy would get your synagogue thrown out of the Orthodox Union. 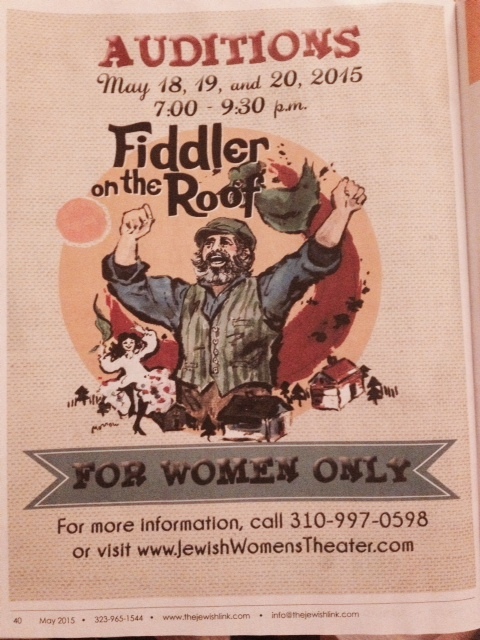 Orthodoxy, in an attempt to reconcile the gender segregation with modernity, has created an all women cast of Fiddler on the Roof and all women minyanim to try and allow women to read from the Torah. This is done lest men hear women singing and become aroused, or lest men become embarrassed by a woman reading from the Torah (in the Talmud section entitled Megillah, women are forbidden from reading the Torah in front of men as it would imply the men are too ignorant to read the Torah). They cannot however, integrate the genders. Progressive (Reform, Liberal, Conservative, Recon, Renewal) Judaism have been pushing against this sort of thing for a long time. Any claim that such a practice is ‘feminist’ or ‘egalitarian’ or ‘inclusive’ is essentially an attempt to co-opt the narrative of modern society.